Many people in the forums don't like independent targeting as it is currently in the game. There is already a few threads about this and while i can not agree with the side that simply wants every single turret to be independent targeting (because they got their own gunners), that does not mean that I am happy with how it is at the moment. 1. 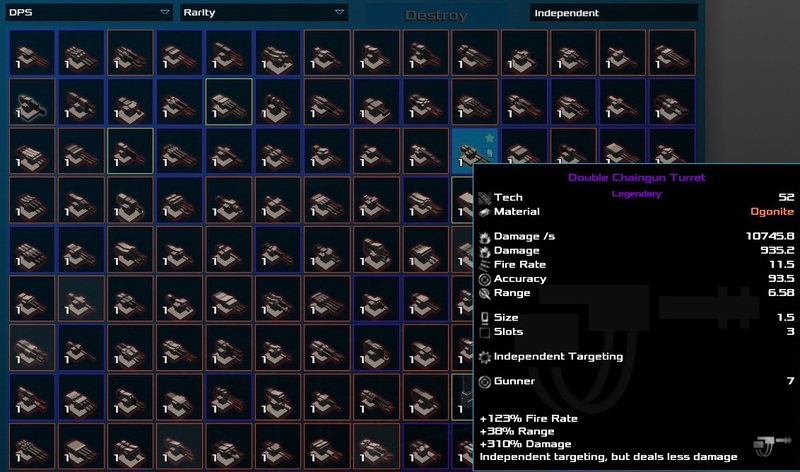 Remove independent targeting as a turret specific bonus! 2. Give the independent targeting menu to every turret aviable in the game! 3. Apply the usual damage multiplier when a turret is set to independent targeting (I think its damage gets cut in half, but I don't know), but give it the full stats when it is manually controlled! Honestly it is pretty annoing to always choose between damage and Function. Please consider this change, as it would make the overall gaming expierience a little smoother in my oppinion. Also I think 25% damage reduction is enough. 50% is really harsh. In practice, how much DPS your non-independent-targeting guns have? How much DPS per slot you need? Look at them, you think they are weak? Couple of them are even 0.5 size and above the highlighted one. majority of better guns have independent targeting. And that 50% dmg reduction is only applied when turret is created in factory, not when researched. Well, for me it wasn't a problem until I started on Insane. It basically meant I had to start crafting every turret in turret factories to keep DPS up to date with pirates, xsotan and especially faction ships. That's fine in itself, but independent targeting takes too much off the top. I might find good drop turrets every now and then, but not enough to outfit more than one ship. Finding a good turret factory on every material level takes a godly amount of luck (or lots of money building your own set of turret factories). So yes, independent targeting takes too much off the top considering the benefit, because Independent targeting turrets don't really do too well with moving targets, even lasers can't hit that well. Maybe the scale of the damage reduction should be different depending on the difficulty somehow. Nachtu, so you are playing on Insane and without using any Research Station. Cool challenge. Yeah, I like to produce larger amounts of uniform turrets. It gives my ships a bit stricter firing profiles. Did you bear in mind that these 10k Omicron of your chaingun turret would not change with my suggestion? Rather than having weaker Independent Targeting turrets, I would like there to be "Manual" turrets, that are 50% stronger and have 30% reduced power and crew demands. All other turrets should have Independent Targeting as a core feature, in order to accentuate autonomous broadside and maneuvering combat over face-to-face, "fire everything!" standoffs of today.